The UMass Journalism community gathered Saturday, Sept. 26, 2015, to dedicate the Professor Howard M. Ziff Gallery in the Journalism Department. 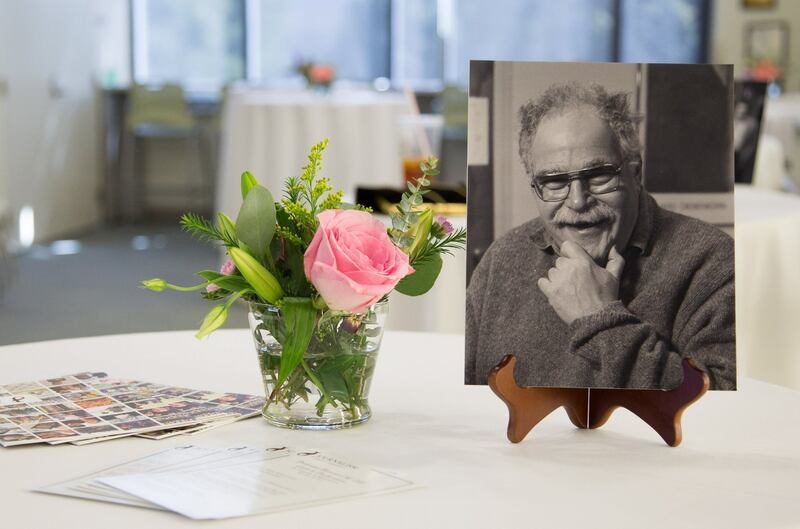 Sean ('85) and Jayne ('85) Dandley named the department's common gathering space to honor Professor Ziff, the founder of the Journalistic Studies program at UMass. The Dandley family supports UMass Journalism with student internship awards and a technology fund, making it possible for journalism students to stay current with digital technology and reporting tools. The afternoon began with student-led tours of our new facility, followed by the gallery dedication with guest speakers Kathy Roberts Forde, chair; John Hird, dean of the College of Social and Behavioral Sciences; Ralph Whitehead, professor; Max Ziff, the son of Howard and Jane Ziff; and Sean Dandley '85. The dedication also included a video tribute to Howard produced by Greeley and Olga Kyle, instructors in the program. Kaitlin Boyer, class of 2016, created a video of the dedication for Amherst Wire TV. The celebration then moved to the Amherst Room in the Campus Center, where guests reminisced, dined and shared memories of Howard Ziff. Kevin Cullen '81, Pulitzer Prize-winning columnist of The Boston Globe, gave the keynote address, and Larry Carpman '75, UMass Trustee and partner at Northwind Strategies, gave a remembrance. B.J. Roche and Forde recognized and thanked donors for their support throughout the years and now. UMass Journalism is growing and changing rapidly, and we look to our alumni to help mentor and support our students. Our students were on hand to photograph and write about the event. Stephanie Berenson provided the photography on our Facebook page, and Katie Bowler covered the event for Amherst Wire, UMass Journalism's online magazine. Thank you to everyone who attended our dedication and alumni reunion. We are grateful to all of you and to Howard Ziff for creating this strong community. Please consider giving to the Ziff Fund for Student Innovation, which honors Howard's committment to students and prepares the next generation of digital storytellers. This fund will support initiatives such as Amherst Wire, large-scale student reporting projects, scholarships and special student programming.